In the year since my previous visit to Bergen and Bergen Ølfestival 2013 a lot has happened in the city with regards to craft brewing; 7 Fjell Bryggeri has started brewing, UNA Kjøkken & Bryggeri is just about to while the two year old Baran Bryggeri discovered that their brewing capacity was too small and have installed larger equipment to expand their business. 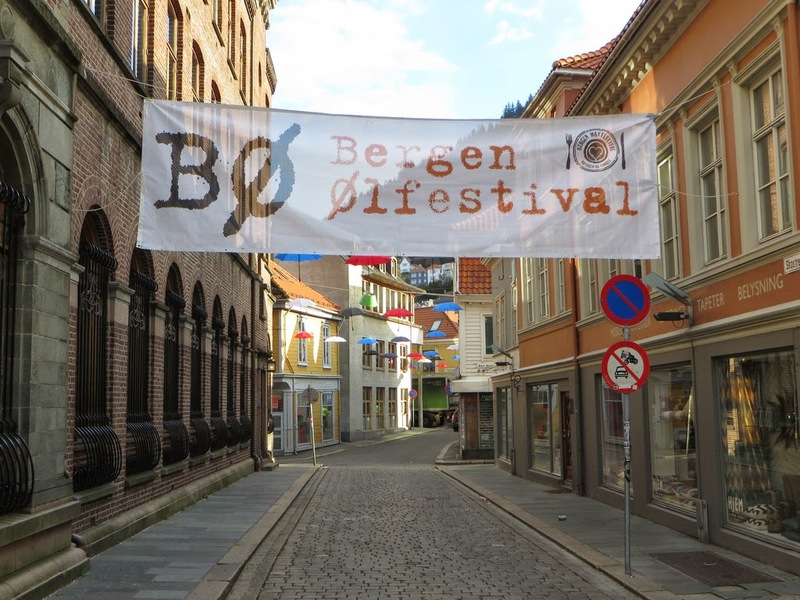 This post is an attempt to take the beer pulse of Bergen in the autumn of 2014 and also give a quick review of my impressions from Bergen Ølfestival 2014. 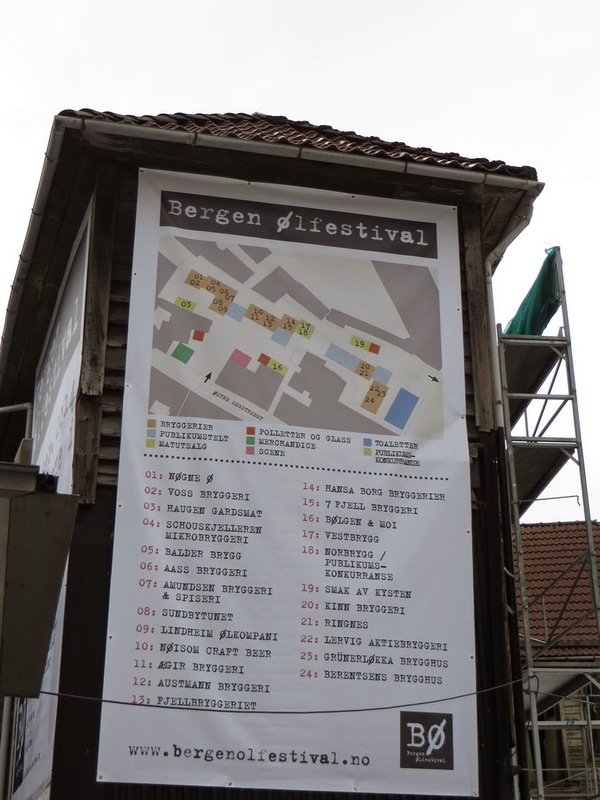 As I pointed out in my post last year, Bergen Ølfestival (BØ) had outgrown its location at Bryggen. Thus I was happy to learn that the organizers were of the same opinion and had secured a new, supposedly larger, location this year. The new location is in Østre Skostredet in Vågsbunnen, a couple of blocks south of Fisketorget. That and the fact that they had ditched the smart payment system (which failed so miserably last year) going for the well tried and simple token based system, for purchasing beer samples, made me very optimistic about the 2014 festival. 7 Fjell Bryggeri: Craft brewery launched October 2013. Aass Bryggeri: Norway's oldest brewery, founded 1834 and still family owned. Austmann Bryggeri: Craft brewery launched June 2013. Balder Brygg: Craft brewery launched June 2012 . Berentsens Brygghus: Family business founded 1895. Turned to brewing in May 2005. Fjellbryggeriet: Craft brewery launched August 2013. Grünerløkka Brygghus: Craft brewery launched August 2013. Hansa Borg: Norwegian brewery group, owns Hansa, Borg, CB and Nøgne Ø.
Kinn Bryggeri: Craft brewery launched December 2009. Lervig Aktiebryggeri: Craft brewery founded 2003 in protest of Tou Bryggeri shutdown. Lindheim Ølkompani: Craft brewery launched November 2013. Nøgne Ø: Norway's largest craft brewery, launched 2003. Part of Hansa Borg since 2013. Nøisom Craft Beer: Craft brewery launched August 2013. Ringnes: Largest brewery in Norway, owned by the Carlsberg Group since 2004. Schouskjelleren Mikrobryggeri: Brewpub opening on October 1, 2010. Sundbytunet: Brewpub opening on 11.11.11 (November 11, 2011). Voss Bryggeri: Craft brewery launched March 2013. Ægir Bryggeri: Brewpub and later craft brewery opening in May 2007. For me it was the many west coast craft breweries that attracted most of the attention, ranging from seasoned veterans Lervig Aktiebrygeri, Kinn Bryggeri and Ægir Bryggeri to intermediate (in size and age) Balder Brygg and Voss Bryggeri to the new generation, opening in the last 12 months or so, Fjellbryggeriet, Lindheim Ølkompani and Austmann Bryggeri. The latter two are not strictly west coast breweries but still exotically distant from my Oslo perspective. Like last year, entrance to the festival was free but in order to taste beer you would A) need to be older than 18, B) have the official tasting glass that holds 1 dl samples and C) offer a token or two for each beer. Tokens could be purchased at several locations around the festival grounds, making it easy to obtain them. You got 4 tokens for 100 NOK. Most beers cost 1 token, but some limited releases or high ABV beers cost 2 tokens. I bought 20 extra tokens, in addition to the three that came with the tasting glass, and that saw me through the entire first day. With so many different beers to try, even though I had just 1 dl of each, there was no way I could taste all of them, even in two days. So I sat down before the festival opened, writing down a shortlist of what I really wanted to try and what would be nice to taste if I had the time. It was also important to find out which beers were limited, such as Balder Turken which was available in one 20 liter keg only and Nøgne Ø Skog & Mark, or beers that would be available just one of the days, such as Nøisom Corvus and Nøgne Ø Dragonwort Stout. At beer festivals you always have to make trade-offs, ideally you would want to start out light and progress towards higher ABV and IBU. But there are two caveats with such an approach. The first is that your taste buds will deteriorate even as you drink light pale ales and lagers, so you really should try the "best" beers early, to get the full aroma and flavor impact. Secondly, it's usually the strong, intense beers that are most limited and will run out first, so if you spend too much time drinking the lighter stuff, which usually run out last anyway, you may miss some of the beers you had on your shortlist. Thus, trade-offs must be made. Start with a few light ones, then jump to a few strong and limited beers. Then take a break, drink some water and get something light to eat (nothing too spicy) to let your taste buds recover, then start the cycle all over again. For me some of the most exciting new beers at BØ 2014 came from the well established craft breweries. One of these beers was Nøgne Ø Skog & Mark, a limited beer brewed with a number of local herbs for Sundvolden Hotel. Its green floral character and fine spices should make it a wonderful beer to pair with meat of wild game. I was also really impressed with Ægir Hyrrokkinn, listed as a 6% India Peated Ale, which had an aroma of fresh hops but a flavor that brought out a wonderful, mild peated note towards the finish - adding another dimension to the good malt body and fresh hops. I also got to taste Kinn Tradisjon brewed with kveik, an old Norwegian farmhouse yeast, which I quite enjoyed with its sweet bready yeast character. Once You G-o Black, a 13.5% Bourbon BA imperial stout from Lervig Aktiebryggeri, impressed me with its smooth, rich taste with a delicious chocolate and vanilla character. Another interesting newcomer was Nøisom Corvus, apparently a "saison imperial stout", which worked surprisingly well. Among the highlights of the festival, I'd like to mention the often underrated but always well made and elegant Sundbytunet Blond, a 6% Belgian-style blonde ale, brewed at Sundbytunet brewpub in Jessheim where Swedish brewmaster Frank Werme holds sway. Another tasty favorite was Stelliger Divum 2013, a 19% abv doppelbock brewed once a year by Berentsens Brygghus. Aged for about one year and served on draught, Stelliger Divum is a sweet beer with a lovely dried fruit character, reminding me more of an aged port wine than a beer, it was dangerously drinkable for such a strong beer! Another excellent beer, actually from last year too, was Balder Turken - a smooth, ripe fruity doppelbock brewed with smoked malts. And Ægir Natt was as impressive as always, a rich and delicious imperial porter. Kinn Svartekunst 2014, on the other hand, was still a bit sharp but should age well, as it said on the label - "best after 2015". 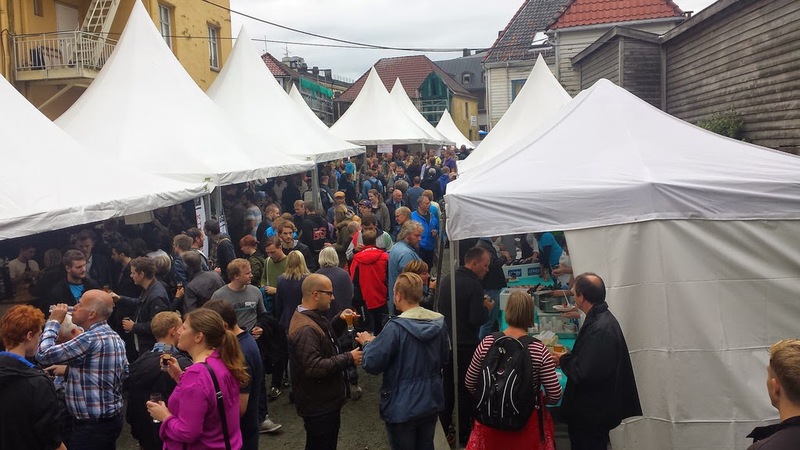 In addition to the huge beer selection, the festival organizers had engaged several local restaurants and food producers, such as Haugen Gardsmat, Bølgen & Moi and Smak av Kysten to run three separate food stalls at the festival. I really enjoyed the fish soup at Smak av Kysten and the awesome deer burger from Haugen Gardsmat. Yummy! Nothing beats local food served with local beer! As for the new location in Østre Skostredet, even if it was slightly larger and didn't have the narrow bottlenecks of the previous location at Bryggen, it did get terribly packed both Friday and especially Saturday. On Friday I could move freely around for the first four hours, until people started arriving from work, but by 6 pm it became so crowded I left to seek shelter at Baran Café. Saturday was even more crowded, but I was there for the noon opening and managed to enjoy a couple of hours of relative quietness before the noise and queues overwhelmed me. Next year I hope the organizers will either put a strict limit on the number of visitors allowed inside or move the festival to an even larger location, such as Koengen. But that would be sad as I really enjoyed the charming and central location of Østre Skostredet. A final tip for next year: Don't put the initial tokens that a visitor gets with the tasting glass inside the glass, they tend to get stuck at the bottom of the glass and are really hard to get out. It's just an unnecessary frustration, so don't. All in all, Bergen Ølfestival 2014 was really well arranged and deserves the title of the best beer festival for Norwegian beer, with a top lineup of new and older Norwegian breweries and catering to 13,000 guests in two days. My warmest congratulations to the organizing committee and to the large number of volunteers from all over the world who helped making this such a great festival - thank you everyone! Bergen Ølfestival 2014 - crowded but awesome! Since my visit to Bergen a year ago two new breweries have opened up, a third one just finished expanding and a fourth is under installation. Named after the seven mountains surrounding Bergen, 7 Fjell Bryggeri was founded in 2013 by three local patriots and business men, Jens Eikeset, Steinar Knutsen and Morten Dale, who felt the time was ripe to start a proper craft brewery in a city that had been dominated by the industrial brewery Hansa for more than a century. The founders enlisted the help of beer judge and veteran homebrewer Ghar Smith-Gahrsen as brewmaster. 7 Fjell was launched in October 2013, actually before they had a real brewery. The early launch was possible because they had signed a deal with Lervig Aktiebryggeri in Stavanger, allowing Smith-Gahrsen to brew the 7 Fjell beers there until the brewery was ready. But in order to purchase a top quality brewery the owners needed to raise more money. In March this year they got lucky when the former Mayor of Bergen and famous coffee magnate, Herman Friele, invested 3 million NOK in the company. For that money Friele received 20% of the shares and could put his wife, Renate Hjorteland, on the board of 7 Fjell. A suitable location for the brewery was found at Bønes, south of Bergen, where the brewery equipment was installed in the late spring. In June 2014 the 7 Fjell brewery was finally operational, with a 20 hl brew kettle and two 20 hl fermentation tanks. The plan is to keep adding fermentation and storage tanks until the brewery reaches an annual capacity of 420 thousand liter which the owners think is sufficient. 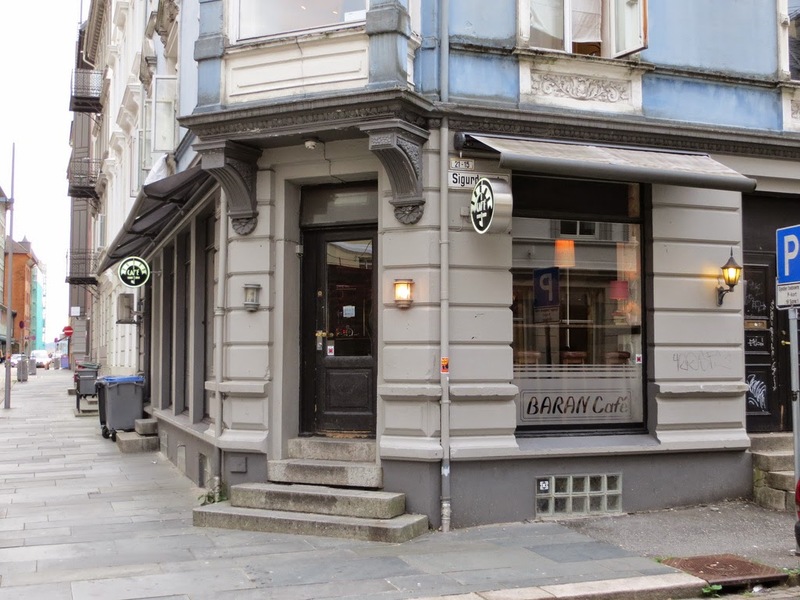 Baran Café had become an institution in Bergen, famous for its Persian food, when current owner Ali Mostofi took over the reins from his father in 2007. But Ali didn't only want to run a café, his great passion for beer and homebrewing led him to the idea of starting a micro brewery for serving beer at his café. This became a reality when he and Lasse André Raa launched Baran Bryggeri in Fana, south of Bergen, in June 2012. Baran Bryggeri was among the local breweries attending Bergen Ølfestival 2013, so I had already tried some of their beers when I returned to Bergen this year. To my surprise I didn't find Baran on the program for BØ 2014, but I found out why when I stopped by at Baran Café after the first day of the festival. It turns out that Baran Bryggeri had been struggling to meet demands, the brewing capacity was simply too small, so a new brewery had been ordered and the old equipment thrown out this summer. However, the new equipment got delayed which meant they couldn't brew anything at all this summer, which caused them to run out of beer - both at the café and for the Bergen Ølfestival. Thus Baran Bryggeri were forced to cancel their participation at BØ 2014. When I stopped by Baran Café in early September, the bar was still out of their own beers, though they had some excellent guest beers on draught instead - including Flying Dog Snake Dog IPA and the Swiss sour ale Trois Dames La Tentation. I also got the chance to speak with Lasse André Raa, who happened to be bartending that night, and he told me that the new brewery had been installed and that the first batch would be brewed the following weekend. 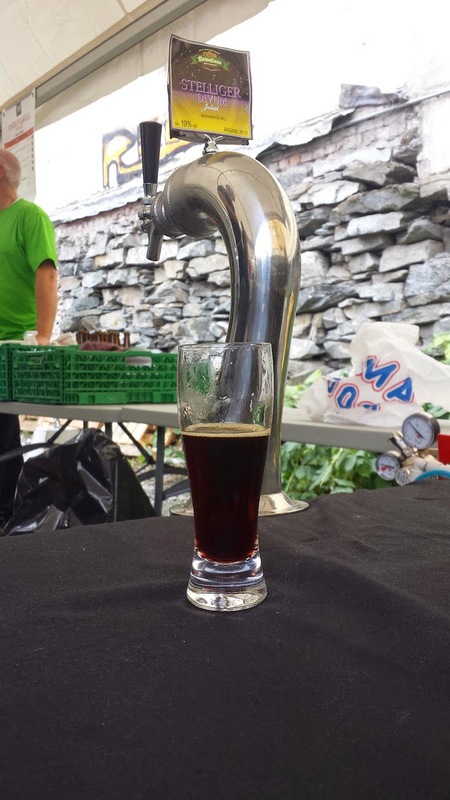 So, if all goes well the Baran beers should start coming back on tap at the café in early October and next year the brewery should be back at Bergen Ølfestival again. Back in May 2014 a brand new beer place opened up on the tourist trail at Bryggen in Bergen, with the intriguing name UNA Bryggeri & Kjøkken. It is listed by RateBeer as a brewpub, but that isn't really the case. At least not yet. Instead, when I made my visit at the beginning of September I found an excellent gastropub, which offered 20 beers on tap and a tempting food menu, with the Fresh Catch of the Day being a great choice for me. Behind UNA you'll find three local business men, Terje Johan Skjelbred, Per Jørgensen and Steinar Knutsen. The last one is also one of the owners of 7 Fjell Bryggeri, which is probably part of the reason why the "house beer" - the 4.7% UNA Blonde Ale - is brewed at 7 Fjell. 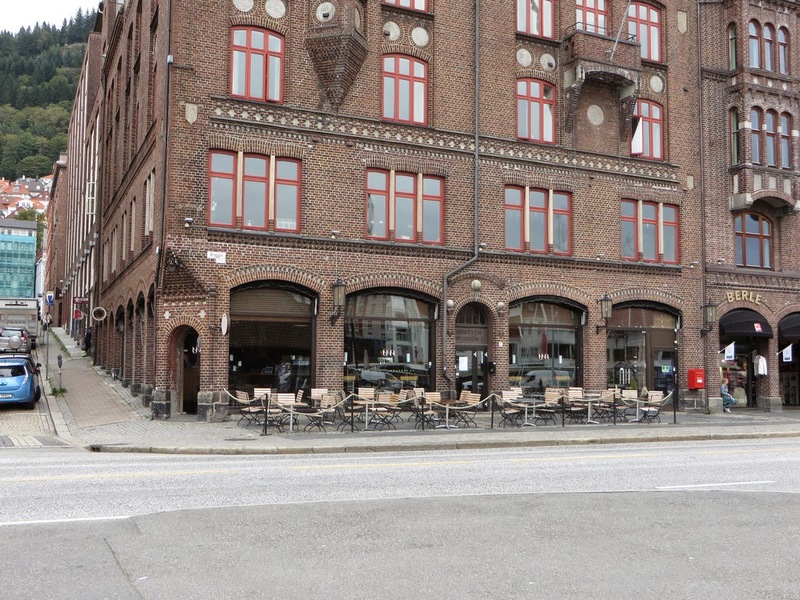 The owners of UNA do have a higher goal than just opening up a good gastropub, they want a proper brewpub at Bryggen where passers by can look in through the large windows at a working micro brewery on the ground floor. 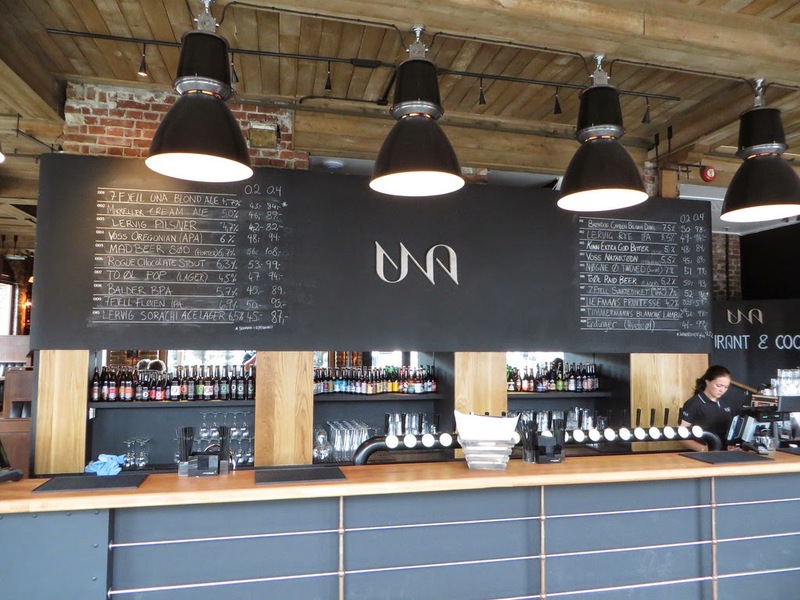 When I visited UNA, I overheard one of the owners discussing the design and floor layout of the micro brewery, with a mason or carpenter (not sure which), so it's obvious that work on installing the brewery is about to start. Fortunately, the future head brewer at UNA Bryggeri, Jan Thomas Nybak from Moss, was in the bar when I visited and had time to talk about the brewery plans. He said that the goal is to have the brewery installed late this fall and hopefully be brewing beer by the end of 2014. Nybak said that his aim is to brew more exciting and varied beers than the larger craft breweries, such as 7 Fjell, can afford to, since his batches will be a lot smaller. He also alluded to someone named Joel who will help out at UNA Bryggeri and apparently has brewed at Partizan Brewing in London! Name-dropping Partizan, like that, made me all ears. If Partizan is the inspiration for UNA Bryggeri, Bergen and Norway is in for some exciting new beers next year. I can't wait to be back! During my trip to Bergen last year I sat in the bar at Henrik Øl og Skjenkestove when a fellow beer enthusiast sat down next to me and we started talking about beer and brewing. He revealed that he had been brewing beer at home for quite a while, using a number of different herbs and spices in his recipes. He had even brewed a sour ale with rowan berries. He then said he was working on plans to open a commercial micro brewery sometime in the next 3-7 months, with a capacity of 350 liter per batch. I didn't think more about this conversation until I came across the registration of Lysefjorden Mikrobryggeri in BDB.no and realized I must have been talking to Rune Birkeland, the founder and daily manager of this micro brewery. Though it seems to have taken a bit longer than Birkeland anticipated last fall, he managed to set up the brewery in his home community of Lysekloster (Lyse Abbey) and get all the necessary permits in order by the summer so that he could start brewing his beer commercially. Around the time I left for Bergen, at the start of September, the first Lysefjorden beer - a 4.7% Pale Ale - was shipped to grocery stores in the Lysekloster area, in Fana and Bergen. Unfortunately, I never had time to visit Matkroken Natland, one of the stores that got a shipment from Lysefjorden, but I will certainly do so on my next visit. And perhaps some good beer bar in Oslo would care to order a case? 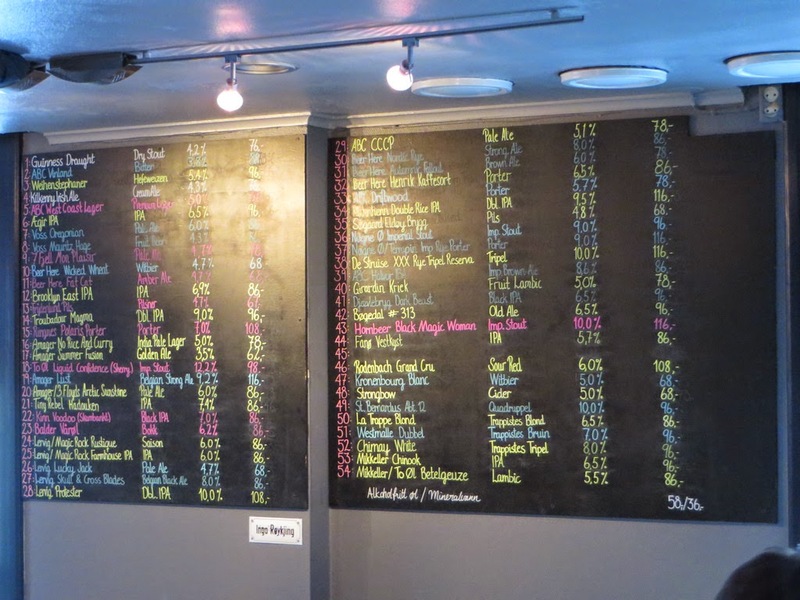 Except for a couple of nights at Henrik Øl & Vinstove, my favorite beer bar in Bergen which had expanded its draught beer menu to 53 (plus one cider), I didn't get the chance to check on any of the other beer places I've visited earlier, such as Naboen, Pingvinen and Kontoret. Hopefully I'll get time next year. In the meantime, enjoy the rest of my photos from Bergen at Flickr.